His was an uplifting story but now his career has been cut short after a bad race crash forced doctors to amputate his leg. Above, leading the way on stage 3 of the Tour De Machakos last month. The source of many uplifting stories in recent years as more and more of its riders emerge, African cycling has been dealt a bitter blow with news that one of its stalwarts has lost his leg. Samwel Mwangi (32) of the Kenyan Riders Downunder team broke his leg earlier this month and has now had surgery to have it amputated. 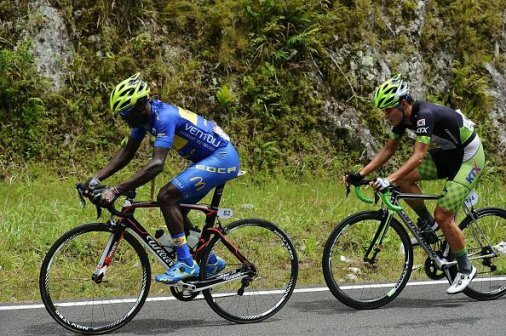 The Kenyan came down in a bad crash during the final stage of the Tour du Rwanda and broke his femur. That break has now had devastating consequences for him after it severed his femoral artery and cut the blood supply. He has had the lower part of his left leg amputated as a result. His team confirmed the news on social media and said they were also looking at options for his future with his cycling career now over. He had won stage 3 of Tour De Machakos just last month and had spoke of his joy at finally getting a victory for himself and how thankful he was to Nicholas Leong. Mentor Leong, the owner of Kenyan Riders Downunder, had encouraged him into full time cycling. And this year, at the age of 32 years, he moved up to the Continental ranks for the first time. “I was working as a boda boda operator (motorbike taxi) in Eldoret before I met Leong,” he said, adding his move into cycling had come after a difficult childhood. “He encouraged me to cut my weight and joined the sport, I was weighing over 100kgs. “I do enjoy cycling because it has done a lot to me. It is like a dream come true to me. “Mostly in the tours I like helping my team mate when they have flats to pace them back to the peloton even though it’s hard work,” he said of his win.